Smart Bananas Math: building and playing with a number line, counting down the number line, circles, measuring length and weight, heavier - lighter, compare and contrast bananas, cutting bananas and water transfer. Guess how many bananas are on the tray! Estimation is not an easy task for preschoolers. With all the support and playful encouragement, we didn't get the estimation number out of My Firefly that day. I mean, look at that face, "I don't know!" They just don't know how many and don't want to make it up. We made this as a family activity, and everybody estimated right: 10 bananas. Then she stated she thinks there are 10 bananas. Modelling helps, and here is a start! To check if the estimation was correct, we decided to build a number line. Invitation to build a number line set up: two trays with bananas and numbers. Pictured below, "this one is a sad banana". We finished our 1 to 10 number line together: she placed a banana, and I placed a number. Counting down the number line went the same way. We had a favorite bear friend visiting. The bear wanted some bananas too! "Hello!" she said, "would you please share some bananas with me? I want 3 bananas!" Three bananas were placed on the tray (pictured above). "But I want 5 bananas now!" Should we add more bananas to make five? How many bananas did we add to the tray? Bear said, "Thank you! But these are too many bananas! I think I only want two." How many bananas do we need to take from the tray? The first banana because it is peeled, the rest are not. The second banana because it is facing the right hand, other bananas are facing the lift hand. The last banana because it's on the plate, the other bananas are on the table. We used a cutting board, a ruler, and a plastic knife to measure and cut bananas in 1" to 5" chunks. Invitation to arrange from the shortest banana to the longest was fun. In the process, My Firefly discovered the chunks that were of the same length. This turned into a free play sensory activity with the cutting board and the scale. I stayed around to comment "heavier - lighter" for the developing active vocabulary. What is heavier: a cup of bananas or a cup of water? (Pictured below.) My Firefly loved using a dropper to balance the scale. The green tray is for containing water spills. We also built circles with bananas. Challenge: can you build a circle with two bananas? 3, 4, 5? 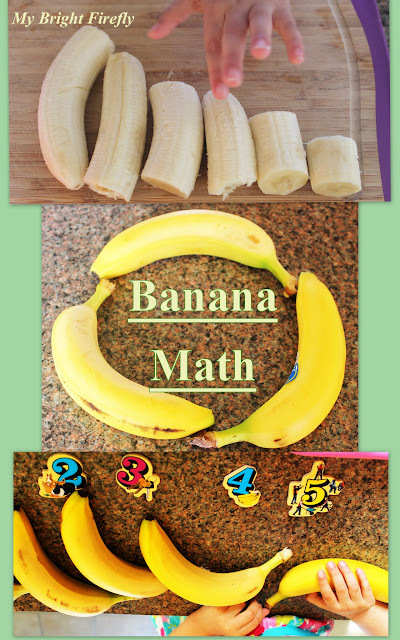 Smart Bananas math activities turned into a fun sensory play and hands-on explorations of the complicated math concepts. How fun!